Compact photo printers like this Photosmart A618 are bread and butter to HP. Each year the company spends tens of millions of dollars refining its inks, optimising its nozzles and blending coatings for its photo paper. It got the formula right some time ago and has been tweaking it since. This new printer is HP's latest compact, and continues with the same familiar shape and ability as its predecessors. It uses HP's Vivera inks, supplied from a single HP 110 Tri-colour cartridge, which costs £15 to replace and has an average yield of 55 prints. The best prints result from using HP's 10x15cm Advanced Photo Paper, a pack of which costs £6.50 for 100 sheets. Value packs and jumbo packs are available to bring these costs down. Expect to pay a maximum of 33.5 pence per print. The prints are wonderful - clean and sharp with no banding and great colour balance. We recommend disabling the Photo Fix filter, though, which tends to overexpose the shots. This requires pushing one button. The control buttons are all clearly marked and the pop-up LCD is clear and easy to handle. 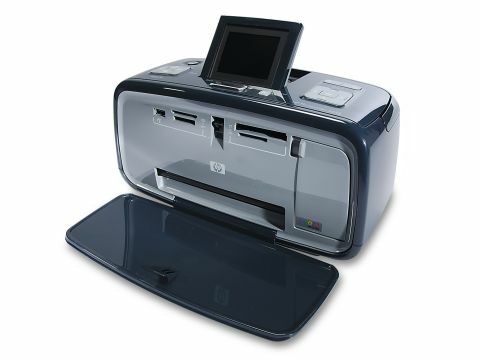 HP's Photosmart Print application comes in the box with this model. We only printed a couple of shots using this app, as we prefer to print directly from iPhoto or from a camera's memory card docked into the printer - the HP A618 has slots for all common card types. A USB 2.0 cable also comes in the box to connect to a Mac, and you'll need to install the included driver to make the printer visible in iPhoto. Printing times are slow but the results are high quality. The A618 produced full-colour prints on 10x15cm sheets of HP's Advanced Photo Paper in 2 minutes and 8 seconds, which is a bit off HP's claimed 39 seconds on the box. Perhaps they were printing close-up shots of snow. But we were happy to wait a few extra seconds for the quality results.